Anyone can prepare food, but taking a professional cooking class can be the difference between serving up filet mignon or PB&J at your next family gathering. Cooking classes in Tennessee are a fun way to spend the day learning new techniques and tasting delicious food. 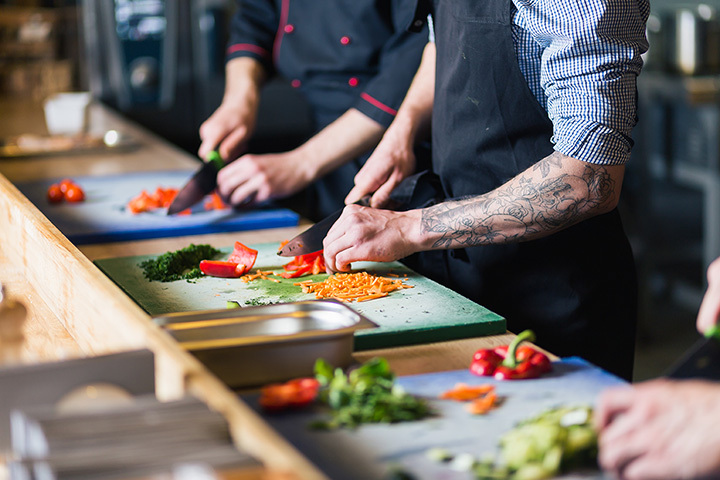 Indulge your taste buds and cook like a pro at these 6 best cooking classes in Tennessee. Ideal for adults and kids alike, the Cutting Edge chops all your fear of being in the kitchen so you can cook with confidence. They provide private classes for birthday parties, girl’s night out, date night, and any other occasion. Or, you can book at spot in one of their public classes or kid’s camps. They provide all the ingredients and apron—you just show up! This hands-on experience takes you through every aspect of the cooking phases, from prep work to cooking to eating to cleaning. They host cooking clubs and kid’s cooking camps alongside their class schedule for adults. And their holiday cooking classes are not to be missed! This artistic studio is for painters and aspiring chefs alike. Inside you’ll find a chef that’s dedicated to the farm to table experience, helping you learn to cook fresh food from scratch that tastes every bit as good as it looks. Everything is included in the class fee, and you’ll get to enjoy every bite of your labor when it’s ready. Using locally sourced ingredients whenever possible, The Curious Kitchen is part cafe, part cooking studio, and 100 percent delicious. Inside you’ll find a quaint, cozy, cottage-like atmosphere that will make even the most clumsy chef feel right at home. Classes are limited to just 16 people to provide personalized instruction, and every skill level is welcome to join. This chain of upscale kitchen and home goods usually has several cooking classes each month, each one featuring a different theme to turn you into a well-rounded chef. Older kids are welcome to cook with their parents, and each participant gets to taste their creation. These classes are usually inexpensive compared to larger cooking schools. This major grocery chain’s best kept secret is its cooking classes offered to the public. They offer demonstrations and hands-on classes, in addition to wine classes that help you learn to pair the perfect vino with your meal. All ages are welcome to attend.